I plan on taking advantage of Mike’s post parasitism and repost that image on another board I frequent (wargaming) as that of the dinosaur Meleagris gallopavo and see how long it takes someone to figure it out. I might cheat and put in a not-to-scale human figure just to mislead. All this as an entré to promoting SVPOW! among the heathen. Oh, and shouldn’t the reference to Sam’s blog merit the tag “stinkin’ bugs”? How come, anyway, that the [i]Ultra[/i]whatever vertebra was ever separately described? Did Jensen think he was dealing with some sort of mass death assemblage or what? MfO, please go ahead — it’s a great idea. Andreas, it’s actually not entirely certain what Jensen was thinking. 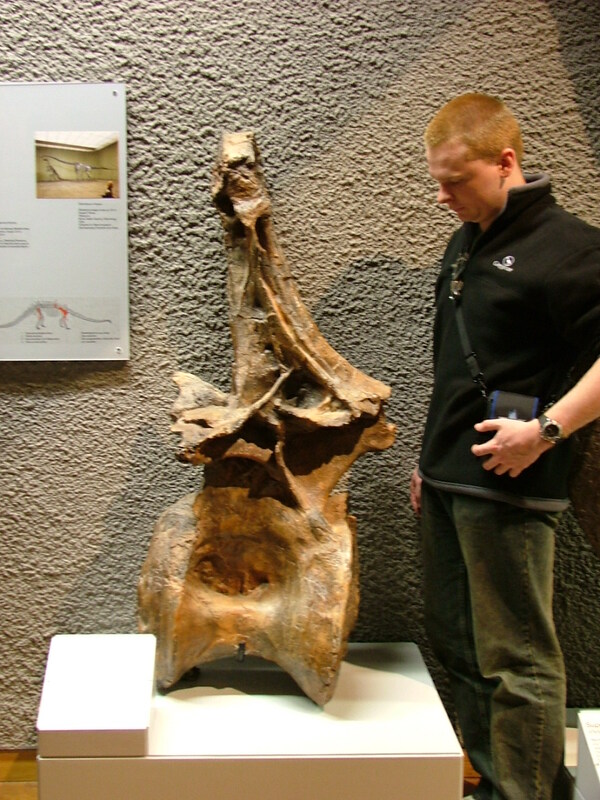 As noted in “Supersaurus — a diplodocid that lives up to its name” at https://svpow.wordpress.com/2008/05/12/supersaurus-a-diplodocid-that-lives-up-to-its-name/ he was a bit of an eccentric, and I think we can reasonably say that he was understandably so excited by his giant sauropod elements that he got a bit carried away. That said, his nomenclatural intentions had been out in the open for more than a decade, thanks to Reader’s Digest, so it seems a bit odd that non-one with more of a background in palaeo looked at the Dry Mesa bones in all that time and told Jensen their thoughts. Maybe it falls into the ‘so many fossils, so few paleontologists’ category. When I think of it, it depresses me to know there are all sorts of fascinating fossils right now weathering into nothing, undiscovered, unknown and perhaps containing the record of organisms we never will know as a result. And who knows what wonders are contained in oil shales that will be broken up and ground into dust (at vast environmental cost) by the millions of tons in our thirst for oil. Those damn fusion guys have to cut out that old ‘fusion energy is just around the corner and always will be’ stuff. Mf0. : Dave Hone had a whole blog posting about fossils weathering away unnoted. The oil shales angle is one I think he missed; so did I. Anyway I’ll see your crumbled fossils and raise you species-going-extinct-as-we-speak. BTW, you should have posted a goose C7 instead, that would’ve made a splash. Fusion is a dead end. I’m pulling for wind power, particularly the no-moving-parts free-ion-transport breed. The North Sea is supposed to offer 3x the UK’s total power demand. The sad thing is that we have both the crumbling fossils and the species going extinct, many of those latter before we’ve ever even noticed them. Seeing the similarities in vertebrae (and other bones too) between birds and large saurischian dinosaurs, it strikes me as surprising mammals were able to take over before birds re-evolved big terrestrial saurischians. I know there were things like Gastornis and the phorusrhachids, but they were dead ends … Were birds just too specialized to re-evolve into sauropod-analogues?